So light and fluffy. Cooked just right. Ooh, custard. Wow, this is so good. This is the best paczki I've ever had. Man, I haven't had a paczki in years. Oh crap. This is probably not vegan. It may not even be vegetarian. How did I get into this situation in the first place? Then, bam, just like that I woke up. In the morning I told my husband about this dream and all he could say was "You silly goose! All you think about is food. You even dream about it." Though he does make a valid point, I have to say that there is no possible way he could understand. He couldn't understand what it was like to grow up with a 12 letter last name containing two z's, only two vowels and ending in those familiar 3 letters -ski, which, to an eastsider (someone from the eastern suburbs or eastside of Detroit) like myself, meant only one thing - you were Polish! My husband never experienced a real winter growing up as a boy in India. That same little boy in India didn't look out at the coconut trees and dream of going to Hamtramck at the crack of dawn to get in line outside for fresh paczkis on paczki day, when it was still cold enough to be winter but you had that feeling that spring was getting closer. And, although that little boy was good at geography, I'm sure he had never even heard of Hamtramck! Hamtramck, to the younger version of myself, was like the Mecca of all things authentically Polish. That's where my Polish ancestors settled after coming to the United States. That's where they read the Polish news, watched Polish movies in theaters, dined in Polish restaurants, cooked Polish food, spoke in Polish, and just about everybody had a good Polish name. Just recently, in fact, I found the program from my grandpa's high school graduation. I read the names of the graduating seniors to my husband and he asked me if I was making them up. I wasn't. You know, maybe part of the reason I found Hamtramck and the Polish stuff so fascinating as a kid, was because my 100% Polish grandpa died when I was just a baby and I couldn't remember him. My dad was probably the closest to his dad, of his brothers and sisters, and my dad was a man of few words. He taught me a few things once in a while, like stories of gross foods I decided I never wanted to try, like duck blood soup (this probably planted the early seeds of vegetarianism into my head) and key phrases like 'it's cold as hell' (really comes in handy in Michigan winters). But it didn't satisfy the endlessly curious little girl that I was. Unfortunately for me, my parents did not share my dream of getting up super early, heading out in the bitter cold and hanging out in Hamtramck for Paczki Day. Did I mention that my dad worked afternoons and hated getting up early? But at least we bought paczkis - lots of paczkis - every year, without fail. We even bought them for some of my mom's (non-polish) relatives too. Did I say every year? Take note, I live near what I sometimes forget is kind of a large city, in the United States. This means that you can get just about anything you want anytime you want. Exotic fruit? Check. Foreign groceries? Check. Out of season fruits & veggies? Oh yeah, all year round. They ship them in from somewhere or other to make sure they're available for your convenience, probably at a store open 24 hours per day. 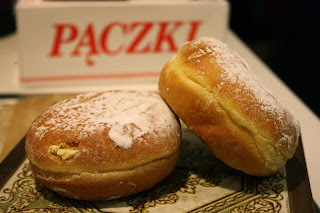 (The truth is that I didn't notice this until a foreign friend pointed it out to me) Paczkis? Only available once per year! At least that's how it was in the 1980s & 1990s when I walked around with big bangs, slap bracelets and flourescent colored clothing, jamming to the likes of Madonna and Prince. This made paczkis so unique - something that was actually a rare treat! Just a note: I will be the first person to admit that custard paczkis are not authentic. So what? I loved them. They're still paczkis on the outside, just with a different filling. I grew up in Detroit, where custard paczkis were readily available and hey . . . I was dreaming!